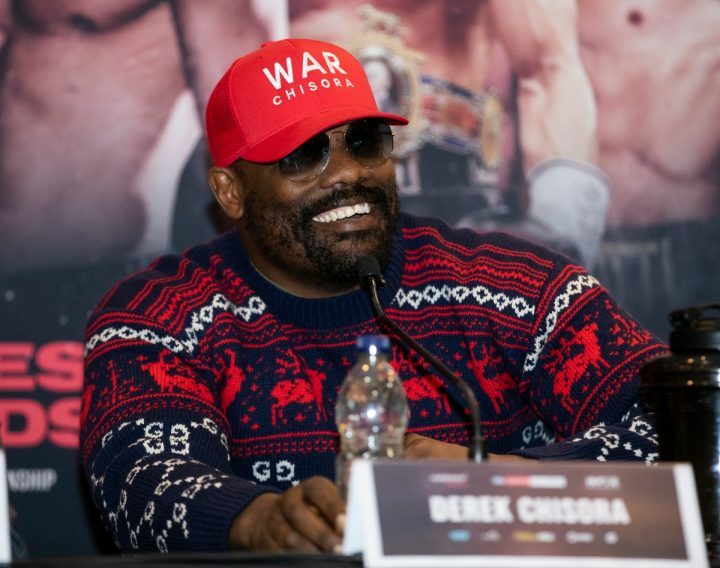 By Mark Eisner: Eddie Hearn is interested in matching former heavyweight world title challenger Dereck Chisora (29-9, 21 KOs) against the winner of the April 20 fight between David Allen (16-4-2, 13 KOs) and former WBA ‘regular’ heavyweight champion Lucas ‘Big Daddy’ Browne (28-1, 24 KOs). Chisora is lowering the bar on the level of his opposition after being knocked out by Dillian Whyte last December. Chisora, 35, will be fighting on the Allen-Browne card this month against Senad Gashi (17-2, 17 KOs) in a 12 round scheduled fight on Sky sports on April 20 at the O2 Arena in London, England. There was a chance for Chisora to fight former WBO heavyweight champion Joseph Parker, but that match-up has failed to happen. With it off the table for now, Chisora will be looking to face the winner of the Allen vs. Browne fight. Allen, 27, is largely viewed as the guy that will win that fight against the 39-year-old Browne, who has seen better days in his career. “Big Daddy” Browne is coming off of a highly questionable six round points decision win over journeyman Kamil Sokolowski (6-15-2, 3 KOs) last month on March 2. Browne was beaten to the punch throughout the fight by Sokolowski, and yet he was given a decision win over him. Allen has the punching power to make sure the judges don’t have a say in the final outcome of the fight against the former WBA champion Browne. Recently, Hearn had been talking about wanting to match former British and Commonwealth heavyweight champion David Price (24-6, 19 KOs) against the winner of the Allen vs. Browne fight, but for some reason he seems to have changed his mind about wanting to do that. It could be the poor performance the 35-year-old Price put in last Saturday night in defeating unbeaten but untested Kash Ali (15-1, 7 KOs) by a fifth round disqualification victory on the undercard of Liam “Beefy” Smith vs. Sam Eggington at the Echo Arena in Liverpool, England. Price was close to being knocked out in the fifth round, but he was able to hurt Kash with a body shot and then a big right to the head. Kash tackled Price and then bit him on the midsection. The way that Price was unraveling in the fifth, he didn’t put in the type of performance that would indicate that he would do well against Allen or Browne. “I also like the fight between Derek Chisora and the Allen-Browne winner. I think that’s a good fight. If Dave Allen can win that, Allen against Chisora is a great fight,” Hearn said to skysports.com. Chisora, 35, needs a win right now after being stopped in the 11th round on December 22 in his rematch with Dillian “The Body Snatcher” Whyte on Sky Box Office at the O2 Arena in London, England. Chisora has to get passed the 28-year-old Senad Gashi (17-2, 17 KOs) of Spain on April 20, and then he can look to fight the winner of the Allen vs. Browne fight. Chisora is ranked #13 with the World Boxing Council. At this point, he should be fighting better opposition than Gashi, Browne or Allen, but these are the guys that are being offered to him by Hearn. Given Chisora’s ripe age, he should be pushing Hearn to put him in against highly ranked contenders like Adam Kownacki, Charles Martin, Luis “King Kong” Ortiz, Joseph Parker, Alexander Povetkin, Agit Kabayel and Oscar Rivas If Chisora could beat one or two of those guys, he would be quickly moved up the heavyweight rankings. If Chisora is going to devote a lot of time to slowly rebuilding his career after his loss to Whyte, he could end up chewing up a few years. It’s been seven years since Chisora challenged for a world title against former WBC heavyweight champion Vitali Klitschko in February 2012. The years have slipped away for Chisora with him failing to get another world title shot. Chisora fought well against an injured Klitschko in that fight, but he didn’t have the size to get past Vitali’s left hand. It was thought that Chisora would come back from that loss and quickly get another world title shot, but that’s failed to happen due to him losing key fights to David Haye, Tyson Fury, Kubrat Pulev, Agit Kabayel and Whyte x 2. If Chisora is going to waste time fighting lower level guys like Gashi, Allen and Browne, it’s going to take him a really long time before he eventually gets another shot at a world title, if he ever does. Allen has done a remarkable job of turning his career around lately in winning his last three fights in beating Nick Webb, Samir Nebo and Ariel Esteban Bracamonte. Before Allen reeled off those three victories, he was stopped by 2016 Olympic Gold medalist Tony Yoka in the 10th round last year on June 23. That was a case of France’s Yoka having too much size and talent for the 6’3″ Allen. Even with Allen’s self-confidence soaring high right now due to his recent three-fight winning streak, he would still be out of his class if he were to fight a talented fighter like the 6’7″ Yoka right. Allen can beat certain guys, but Yoka is beyond what his physical ability will allow him to do. Browne still has knockout power at 39, and he’s got the experience of having shared the ring with the likes of Ruslan Chagaev, Dillian Whyte and Andriy Rudenko. Allen has fought Whyte as well, and lost to him just like Browne did, but he’s peaking right now, and he ha excellent punching power. Browne’s lack of speed could be a problem for him against Allen. Brown’s not likely going to be able to fight hard enough against Allen to put more than a handful of punches together in the fight at any one time. Although Allen has been knocked out before in the past by Yoka and Luis Ortiz, those were against very good fighters with a lot of power and talent going for them. Browne isn’t in the same class as Yoka and Ortiz. He’s a grade lower than those fighters, and he doesn’t have the stamina to be able to put enough shots together to hurt Allen and potentially stop him. The Australian Browne has won his last three fights since getting stopped in the sixth round by Whyte last year in March Browne has lost some weight, but remains painfully slow of hand and foot. In his last three fights, Browne has beaten Junior Pati, Julius Long and Kamil Sokolowski. As this writer mentioned, Browne’s win over Sokolowski was very questionable. You can argue that he got the win based on the poor record of Sokolowski, who came into the fight as the B-side of the equation. Sokolowski has greatly improved in the last two years, but he’s not getting the nod with the judges.